Just when the rolling tide was black and white, when it was Juventus’s players imploring their fans to raise the volume, as if they even needed asking, when the nerves were Barcelona’s and the tension was rising, just moments after Leo Messi appeared to be struggling, the stride slow and the brow heavy, he was up and running again. Others ran with him. There was space now, for almost the first time, and off Messi went, heading at the defence. He shifted inside and took aim. Gigi Buffon dived to his left and pushed the shot away. And there was Luis Suárez. Sprinting in behind Patrice Evra, the Uruguayan got to the ball first and sent it back into the net. He kept running, leaping over the advertising board before sprinting across the vast space behind the goal separating the goal he had scored in and the fans celebrating it, and over the gigantic Barcelona shield on the floor, arms wide. He kissed his fingers, that familiar celebration, and reached the running track by the delirious fans. There, his team-mates soon joined him. Messi had made it, Suárez had scored it: the 121st goal scored by Messi, Neymar or Suárez this season, the most effective attacking trio in Spanish football history, and the goal that would give Barcelona their fifth European Cup. The league and Copa del Rey winners now added the European Cup to complete a treble; “perfection”, as Gerard Piqué had put it. As the clock ticked down, they made sure. Neymar made it 122 goals for the “MSN” with the very last kick of the game. The trophy was Barcelona’s. Another one. 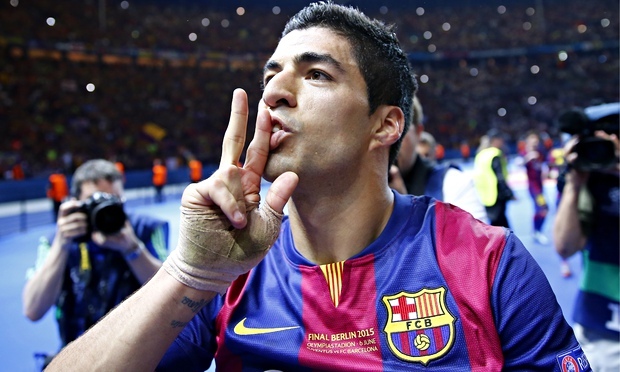 For Suárez, the significance was gigantic. For any player it would be, of course, but for him perhaps more so. A season that started with him unable to play, banned for biting Giorgio Chiellini at the World Cup, a pariah who was booted out of that tournament and unable to join Uruguay in the Copa América too, ended with him scoring in the European Cup final. It has not always been an easy season; Suárez had scored three goals before Christmas, but he has scored 22 since then and there is reverence now. Scorer of the winner in the clásico, the goal that perhaps more than any other took them to the league title, he has marked this competition as well. This was his seventh goal in 10 games. He got two in Manchester, two in Paris, and gave two assists in Munich. Now, he scored in Berlin too. When he departed in the dying minutes, the fans chanted his name. Suárez needed this. For all his talent, it is remarkable how long it has taken for him to get it. Suárez is 28. Holland’s player of the year, England’s player of the year, a Copa América winner with Uruguay and player of the tournament too, but his club career has actually been startlingly modest when it comes to silverware. Just three titles in Europe until this season: a Uruguayan title, the English league cup, a Dutch cup and a Dutch league, clinched six months after he departed, the medal sent to him by post. In nine months at Barcelona he has won as much as in nine years in Europe. A man who admits that it is not so much that he wants to win as that he needs to win, he joined the right club. This was Barcelona’s second treble in six years. No team in Europe has ever won two trebles before and no team has dominated the decade like them. That is four European Cups in 10 years now; no one else has more than one. This is a new Barcelona, though, and his role in their success is hugely significant. Piqué had insisted on the eve of this game that he hated comparisons and begged people not to constantly play one Barcelona team off against another but that is inevitable and the way this final was won will only add to that. Messi is Messi, and Barcelona will always be Messi’s Barcelona, his role in both goals colossal here. Andrés Iniesta was decisive in the opening goal and voted the man of the match. And there was a late appearance for Xavi Hernández, making his 900th professional appearance and his last in Europe, the finest playmaker in Spanish football history lifting that trophy again. But it was two new men who scored the key goals; two men who symbolise the shift in style. Ivan Rakitic had given Barcelona the lead: the first player other than Messi, Neymar or Suárez to score for Barcelona since the quarter-finals. Twenty-seven of their 31 European Cup goals have been scored by the MSN. The first here, after three minutes and 24 seconds, was not. Nine of the 10 outfield players touched the ball in the move – the one that did not was Suárez. Messi’s diagonal ball opened up the space, Jordi Alba sidefooted a volley into the path of Neymar and, although his first touch was a little heavy, he found Iniesta. Iniesta, who had dashed past Arturo Vidal, could have taken on the shot himself. Instead, he waited, that pause that sets him apart, like a man whose second hand moves at a different rate to everyone else’s. Imperceptible but impeccable. He nudged the ball back and Rakitic swept it past Buffon. This was the third final in which Iniesta had provided an assist: in Paris in 2006 it was for Samuel Eto’o; in London in 2011 it was for Messi; here, it was for Rakitic. A Europa League winner last year, Rakitic had the European Cup this year. When he returned to Sevilla this season, supporters held up a banner saying “thank you”. Although Barcelona still needed another, Álvaro Morata’s goal increasing the nerves, and although the Croat’s goal would not prove the winner, the sentiment will be similar in Catalonia now too. Johan Cruyff says that the thing that most struck him when Barcelona won their first European Cup in 1992 was that people stopped him, not to say “well done” but to say “thank you”. Ronald Koeman scored the goal at Wembley; Rakitic had scored it here. The first time is always special, but these will be gratefully remembered too. Koeman, Eto’o, Belletti, Pedro, Messi and Villa; Rakitic, Suárez and Neymar.